Comics and pulps, they are literary cousins. They have been from the 20s and 30s on to today’s paperbacks and Marvel & DC offerings. As long as it has colorful heroes, dastardly villains and tons of action and adventure, we readers can rely on a jolly fun ride. Nothing enhances that experience more then a new subgenre created in the past thirty years; that of the prose superhero novel. In other words a pulp tale about a superhero. That’s what “Tommy One and the Apocalypse Gun” is in it’s the purest form. It is jam packed with everything that makes pulps so much fun. Set in Norfolk, VA shortly after Second World War, Tommy One is the town’s superhero protector. Whenever a threat arises, the blonde haired, affable teenager is on the scene battling to save his fair city. What the citizens of Norfolk do not realize is that Tommy One is a clone created by a German born scientist named Weitmurch. Prior to the war, Hitler charged the professor with finding a way to build a super soldier. Happily for mankind, the good professor despised the Nazis and fled his homeland to settle in America; offering the USA the fruits of his amazing research. Though not in time to be employed during the war, Weitmurch eventually perfected cloning through immersion in a miraculous pool of his invention called the Cistern. When floating in this pool, the subject’s consciousness is able assimilate the thoughts of people around the world. Thus when activated, the clone becomes the primary called Tommy One. At the same time, dozens of other “Tommies” were made and were kept busy as a support team for the primary. The real genius of Weitmurch work is that all his clones are mentally connected and the second one dies in action, the next in line immediately becomes aware of all the knowledge his predecessor possessed. Thus the next Tommy One simply went into action without any delay. Since only government officials are aware of the Tommy One Infinity Project, the public at large believes he is only one person. This has echoes of Lee Falks’ classic strip hero, The Phantom. And the way new Tommy Ones pop-up throughout the story, it was easy to recall Wally Wood’s own No-Man from the comic Thunder Agents. Simcoe has taken his inspiration from some very good sources and shaped them into his own unique and original hero. The crux of the book’s plot is the villain, Captain Blackeye, attack on the city using his powerful Apocalypse Gun at the same time his legion of Blood Pirates loot and rob. Complicating Tommy One’s attempts to stop him are two new elements to their long fought history. One, seeing Tommy One die time and time again only to supposedly return resurrected has begun to affect Blackeye’s mental stability. Secondly, a lovely teenage girl name Imogene Throne has stumbled on Tommy One’s home and managed to cajole her way into accompanying him on his mission. Thus, for the first time in Tommy One’s long chain of experiences, he finds himself hampered with having to protect someone else, other than himself. It is a new feeling and one that confuses the young man coming at a most inopportune time. “Tommy One and the Apocalypse Gun,” is well written and Simcoe’s prose flows across the page effortlessly. The story itself is intriguing and this reader found himself quickly turning pages. This is a terrific read with likeable characters we very much would love to see lots more of. 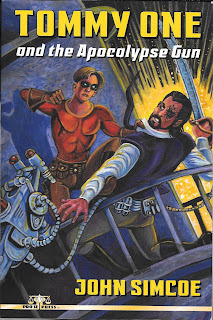 Till then, comics and pulps lovers, find this book and enjoy.